Join the discussion on our forums! Come discuss Zul'jin over in our dedicated Zul'jin discussion topic. Very interesting card design. Outside of a lot of control-oriented spells being released after the rotation, this is clearly designed to be used with the spellstones and To My Side! in mind. Still, who joo wan' me kill? I'm still mad about the voice actor. Edit: also the background, why was it cropped for real. Absolute bull****t of a card. Oh look, another one of those i-win cards that blizzard tend to create now and then without realizing how freakin overpowered and non-interactive they are. 1 card to remove all enemy opponents, make a christmas tree of secrets, draw 6 cards minimum, fill board with beasts, sometimes also deal damage to enemy face with kill commands. Cards like Zuljin, Shudderwock and Yogg-saron (prenerf) truly ruins the game. Can Crushing Walls be cast on yourself with Zul'jin? 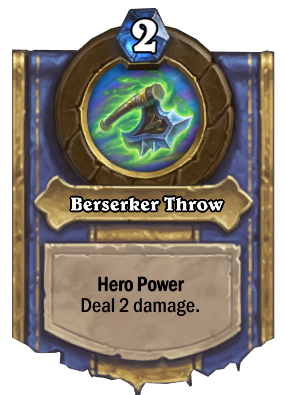 This is my favorite card from Rastakhan's Rumble. "Fill your board with crap and charge minions and clean the board of your opponent." Awesome card and more balanced than DK one. 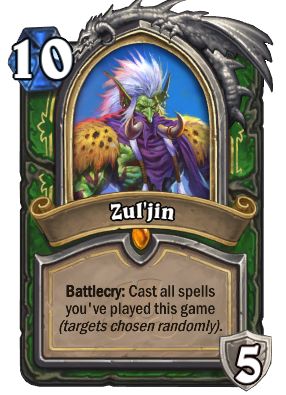 If someone was gonna come up with a 30 damage combo with an effect as strong as Zul''jin's, it might as well be me. This brings up some memories, good ones of course! Although the golden version looks really amazing, without the particle effects I feel like the plain blue background looks a bit dull, wish it would've been spiced up a little. Good card though! 61.5% deck winrate, 65.5% played.